Achankovil Temple or Achankovil Dharmasastha Temple is one of the main Lord Ayyappa temples in Kerala. Achankovil Shastha Temple is one of the five important temples of Lord Ayyappan whose idols are consecrated by Lord Parasurama. The other four temples are Aryankavu Sastha Temple, Kulathupuzha Temple, Kanthamala Temple and Sabarimala Temple. Achankovil Temple is around 17 km from Kottarakkara in Kollam District of Kerala. The idol installed in the temple is believed to be the oldest vigraha installed by Parasurama. The temple enshrines Lord Sree Dharma Sastha along with his two consorts Poorna and Pushkala in Grihasta Ashram (as a family man). The idol of Swamy Ayyappan in the temple is known as “Rudraksha Sila” and is known for its miraculous healing power for snake venom. The left hand of the idol of Ayyappa at Achankovil Temple holds sandalwood paste (Chandan) and holy water (Tirtha). The chandan and Thirtha are said to have medicinal properties for curing poisonous snake bites. Other deities worshiped here are Bhagavathi, Ganapathi, Subramanyan, Karuppu Swamy and Naga Devathas. During the 41 days Mandala Pooja, Achankovil Temple experiences a huge rush of devotees. The temple annual festival is celebrated from the 1st to 10th day of Malayalam Dhanu Masam (December – January). Revathi Festival held during January – February is another major festival during with Therotam (Chariot Festival) and Pushpabhishekam are held. Kumbuvurutty Waterfalls with a Nature Interaction Centre and Manalar Waterfalls are located on the way to Achankovil Temple. 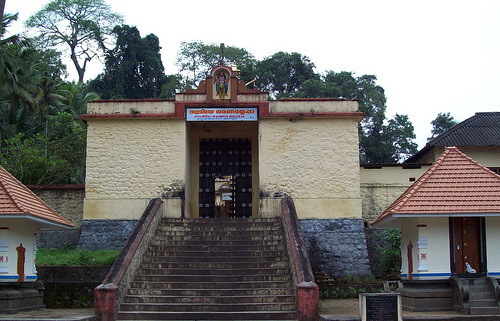 Achankovil Temple is around 125 km from Thiruvananthapuram. Transport bus services and private vehicle services are available from Punalur (80 km), Chengottai, Tenkasi, Konni and Aryankavu.